In recent years, the United Arab Emirates (UAE), which has been spreading terrorism with the United States and Israel, has taken a different direction after the Twin Towers attack on Sept. 11, 2001. The fact that two of the terrorists who carried out the attack were UAE citizens and that they entered the U.S. via Abu Dhabi had shifted attention to the country. The UAE changed its security and intelligence structure following this and received great support from the CIA, soon becoming one of the biggest financers of terrorism. 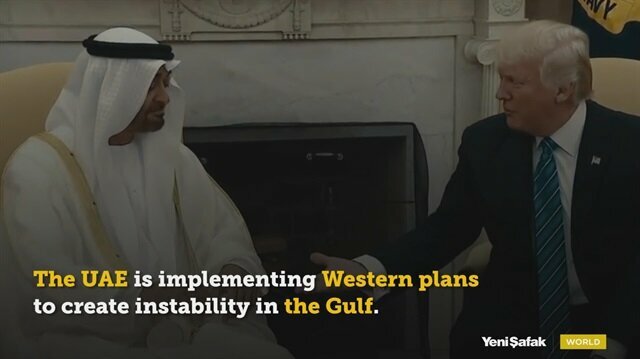 The UAE, being disturbed by Turkey’s strong ties with its neighbors, African countries and the geography spanning from the Syria-Iraq axis to the Balkans, has become a tool used by Western powers in projects aiming to harm Turkey. Abu Dhabi provided great financial backing for Turkey’s failed July 15 coup perpetrated by the Fetullah Terrorist Organization (FETÖ). Abu Dhabi has played a leading role in the boycott against Qatar because it is also disturbed by Turkey’s relations with Doha which have improved since the blockade. Former agents of the Central Intelligence Agency (CIA) are using a facility near the Zayed Port in Abu Dhabi as a base to teach modern spy techniques to intelligence officers of the United Arab Emirates (UAE), according to U.S.-based Foreign Policy news magazine.The CIA also has a training center called “The Academy” near Abu Dhabi where the American security company Blackwater employees are located. At the center that includes a gun range and barracks, driving courses are given, as such in the Camp Peary, the CIA’s base in the Virginia State.Unlimited funds Ex-CIA and U.S. government authorities are attracted to the Gulf country with commitments of an “interesting job” and a “lucrative career.” A former employee, speaking to Foreign Policy, said that he earned $1,000 a day and lived at a five-star hotel in Abu Dhabi, adding that “The money was fantastic.”According to multiple sources, former intelligence officer Larry Sanchez is behind the intelligence training operation. Sanchez is known for starting a controversial partnership between the CIA and the New York Police Department (NYPD) that envisaged tracking “potential terrorists” around New York. Key US officers in UAE Another remarkable figure in the region is Erik Prince, the founder of Blackwater, which the United States used in Iraq’s occupation. The New York Times revealed in 2011 that Prince had dispatched a unit including foreign troops to the UAE to serve Crown Prince Sheikh Mohammed bin Zayed bin Sultan al-Nahyan. Richard Clarke, the former White House counterterrorism czar, also assumed top assignments in the UAE; Clarke worked as a senior advisor to al-Nahyan as the Good Harbor Security Risk Management CEO. British also involvedAn Emirati company called LUAA LLC, managed by a former British Air Service official, undertook the establishment of the spying network. A third Emirati company, DarkMatter, was also highly involved in the process. DarkMatter works for the UAE government on cyber security and intelligence.NSA takes a part in the processIn late 2011, U.S. government advisors and contractor troops helped establish the UAE version of the National Security Agency (NSA) in the United States, of which its name was later changed to the National Electronic Security Authority and then the current Signals Intelligence Agency. Around the same time, Larry Sanchez and his team came to the UAE and started to teach “domestic surveillance.” As president of the low-profile intelligence contractor CAGN Global Ltd, Sanchez began to provide spying and paramilitary training operators in the UAE, with a team that mostly includes former police officers, retired Western intelligence officials and ex-soldiers. Modeled on CIA traningsThe courses, which are modeled on the CIA’s trainings, are divided into various parts, including a “basic intelligence pipeline,” report writing, debriefing, note taking, a foreign intelligence external program, the FBI/law enforcement course and paramilitary training, as well as a boot camp training.External surveillance courses are almost exactly the same as CIA trainings. In one course, former Delta Force operators give militia trainings such as driving and shooting, according to reports.“Usually they’ll go to that course before or after being deployed to a place like Yemen,” one of the former instructors said. The UAE has invested greatly into news sites that propagate anti-Turkey propaganda. UAE news sites that conduct covert perception operations continue to transmit misinformation about Turkey and regional developments. Members of FETÖ’s media structure and figures closely linked to the U.S. are employed by these sites. Abu Dhabi has sought to harm Turkey domestically and internationally by interfering in Turkey’s spheres of influence abroad. UAE is also one of the biggest perpetrators in the atrocities in Syria. Mercenaries working for the American private military company Blackwater entered Syria. Hundreds of these paid soldiers entered the field before Turkish troops mobilized in the region. The UAE trained the Blackwater soldiers. In 2010, hundreds of Colombian terrorists landed in Abu Dhabi and were taken to a camp close to the city. At the time, Blackwater was run by its founder Navy SEAL officer Erik Prince, whose close ties to former UAE President Zayed bin Sultan al Nahyan had been blasted across the media. Turkey’s National Intelligence Organization (MİT) revealed that the U.S. had two separate training camps for the PKK/YPG in Syria. “There are three training camps for the PKK/YPG in the region under the control of the U.S., and approximately 2,500 U.S. Special Forces personnel in these regions,” the Syrian regime had said, verifying Turkey’s intelligence, proving that the UAE funded terrorism and armed terrorists during this period. The UAE constantly spread black propaganda during Turkey’s Operation Olive Branch in Syria’s northwestern Afrin. A site based in the U.K. which is backed by the UAE tried to rally the international community against Turkey. An insidious UAE plan for Somalia has been revealed as Mogadishu seized $9.6 million from a United Arab Emirates' (UAE) Royal Jet airlines carrier that landed in Mogadishu from Abu Dhabi. The seizing of the money stashed in three unmarked bags caused an hours-long standoff between airport officials and UAE embassy staff in Mogadishu. Somalia disbanded a program by the United Arab Emirates (UAE) to pay and train some of its troops as relations soured following the seizure of $9.6 million in cash from a plane arriving from Abu Dhabi. Defense Minister Mohamed Mursal Abdirahman told Somalia’s state news agency Sonna that the government would take over paying and training the troops in the program. "Somalia will completely take over [its troops] trained by the UAE. Those forces will be added to the various battalions of the Somalia National Army," Abdirahman said on Wednesday.The defense minister announced that the troops would be integrated into other units on Thursday.Initiated in 2014 by the African Union military mission to defeat al-Shabab, the UAE has trained hundreds of Somali troops as part of the now axed program.Video: UAE’s insidious plan for Somalia revealedUAE cash seized, taken to Somalia’s central bankSomalia seized $9.6 million on Sunday from a UAE Royal Jet airlines carrier that landed in Mogadishu from Abu Dhabi. The seizing of the money stashed in three unmarked bags caused an hours-long standoff between airport officials and UAE embassy staff in Mogadishu.Counterterrorism units confiscated the bags, and the money was taken to storage in the central bank of Somalia. "The seized money is worth $9.6m. Security agencies are currently investigating where the money came from, where it was going, the individuals involved and the reason for bringing money worth this amount into the country," Somalia's interior ministry said in a statement late on Sunday.The UAE responded on Tuesday, and released a statement claiming that the cash was “allocated to support the Somali army and trainees.”Somalia seizes $9.6m in cash from UAE planeRelations sourRelations between Somalia and the UAE soured June last year when Mogadishu resisted pressure to sever ties with Qatar following a Gulf rift.The UAE agreed to train separatist security forces in Somaliland last month, and has started to build a military base in the port city, a move strongly condemned by Somali officials. Somaliland is a self-declared state internationally recognized as an autonomous region of Somalia.The Somali government rejected a deal between the UAE’s Dubai World, Somaliland and Ethiopia over Berbera port, describing the deal as violating the territorial integrity of Somalia.All activities of Dubai World were banned and it was decided that it should leave the country as soon as possible. The parliament has dubbed the deal as “null and void.”Military discrepanciesAs the UAE infiltrated Somalia to allegedly train soldiers, it also provided funds to armed and unarmed secessionist groups.Soldiers trained by the UAE often had disagreements with other Somali soldiers, leading to shootouts between the troops.